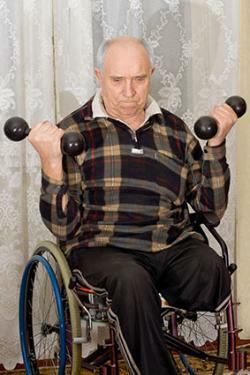 It can be hard enough to find exercises that you're able to do as a senior, but it's even more challenging when you are wheelchair bound. Don't despair, though, because there are plenty of wheelchair exercise options for you to help keep you strong, flexible and healthy. Try out the seated forward bend, seated foot taps, and wheelchair push-ups, to name a few. With wheelchair exercises for seniors intended to increase your flexibility and to stretch your body to help prevent soreness, you will probably move your trunk a lot, and therefore may want to use a wheelchair belt to make sure you don't fall out of your wheelchair. This exercise will help stretch your spine, neck and shoulders. Curl your spine forward and drop your torso towards your thighs. Let your head hang relaxed and heavy towards the ground and let your arms hang down towards your feet. Hold for 30-45 seconds, then slowly rise back up one vertebra straightening out at a time. While this move will strengthen your arms, shoulders, and core, it will also stretch your hamstrings. Grip the back of one thigh with both hands. Brace your core and keep it tight. Using your shoulders and arms, lift your leg as high as you comfortably can. Hold for 30 seconds, then slowly lower leg. The lengthening motion of this exercise will stretch your sides and your neck. Lift one arm towards the ceiling. Stretch the same side of your body as much as you can, reaching through your fingers. Turn your head and keep your gaze up at your hand. Cardiovascular exercises increase your heart rate and are crucial for both heart health and for maintaining a healthy weight. 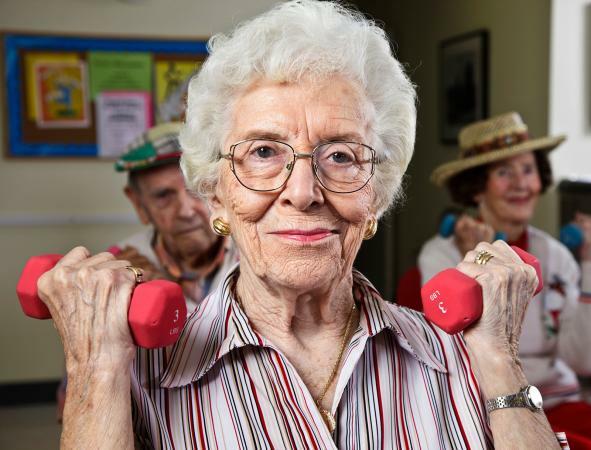 Even if you exercise at a low intensity, you will still reap plenty of benefits. If you are able to move your lower legs, then several minutes of this exercise can elevate your heart rate. The faster you go, the faster your heart rate will be. Aim for five minutes of this exercise and try to increase the duration each time you do it. Start with your toes lightly touching the ground. Bring one leg forward and tap that heel on the ground. With one foot still forward, point the toes of both feet down and tap both toes on the ground. Raise the toes of the front foot and tap that heel on the ground again. Return feet to starting position. This exercise will tighten your obliques as well as get your heart rate up. The faster you go, the more impact you will get. Try doing this exercise in rhythm with your favorite song to make it more fun. Lift your hands up in front of you at chest height with your elbows bent, palms facing away from you and fingers pointing towards the ceiling. 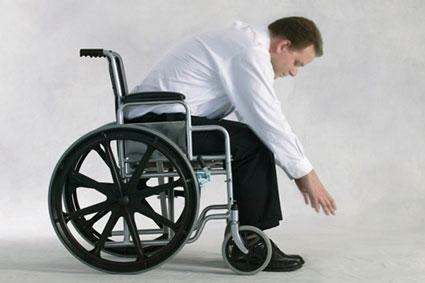 If you have some leg and hip mobility, gently point your knees to one side of your wheelchair. Keeping your core tight, twist your upper body in the opposite direction of your knees. Twist your knees and upper body in the other direction. Continue twisting to alternating sides for three minutes. Strength exercises are very important to help you maintain your muscle tone. Some of these exercises can be done with no equipment, but for some you might want to use light dumbbells or a resistance band. You can also do any of these exercises rapidly to turn them into a strength and cardiovascular workout. This exercise doesn't require any extra equipment and helps strengthen your arms, shoulders and chest. Grip both of the wheelchair armrests. Using your arms, push until your arms are straight or as high as you can go, lifting yourself off of the seat of your chair. Slowly lower yourself back down - don't just let yourself fall. Try to start with ten repetitions and increase the number of repetitions every time you do the exercise. For this exercise, you will want dumbbells to help build the strength in your arms. 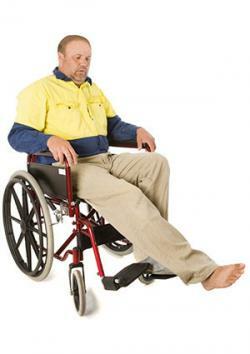 Alternatively, you could hold a resistance band, one end in both hands with the band stretched behind your wheelchair. Grip the dumbbell or the end of the resistance band tightly with your arm extended completely so that your elbow is straight and your palm faces forward. Keeping your upper arm in place against your side, slowly close your elbow and raise your hand as high as you comfortably can. Slowly lower your hand back down to the starting position. Try to start with eight curls on each side and increase that number as you build your strength. Overhead presses target your shoulders and your triceps. You will need dumbbells for this move. You can do one arm at a time, or both together. Grip the dumbbell in your hand in front of your shoulder with your upper arm resting against your side and your palms facing inward. If you want to focus on the back of your arms, tricep extensions are a good choice. You will want a dumbbell for this exercise, and you can do one or both arms at a time. Hold a dumbbell in your hand with your arm fully extended overhead, your hand reaching towards the ceiling. Lower the dumbbell towards the back of your shoulder by bending your arm, keeping your elbow pointed towards the ceiling. Slowly raise your hand back up to starting position. Try to do five of these on each arm at first and gradually increase. A pivotal element of a strong core is having a strong back, and just because you're in a wheelchair doesn't mean you can't strengthen your back. Grab your resistance band and try this move. Grab the middle section of the resistance band with both hands, hands about two feet apart from each other. Keeping your shoulders back and down, pull your shoulder blades together so that your arms come apart, stretching the band. Open your arms as far as you can, ideally all the way out to the side. Try to do this exercise five times at first, then gradually increase. Everyone knows that exercise is great for your body, but it's also important for your mood. It can cheer you up, reduce stress, increase your energy levels and help you sleep better at night. Don't think that because you're in a wheelchair that you can't reap the benefits of exercise. You still have a wide variety of options available to you no matter what your goals!